An interesting idea for a movie starts this film out nicely for a while, until it becomes only about the soccer team and starts to drag on, as if it ran out of steam. Invictus is a clint eastwood movie and that alone should tell you a lot. eastwood is a talented filmmaker who makes interesting movies that just tend to be too sentimental and feel good. his heart seems to be in the right place with the general premise of his films and finding good subjects to make movies about, but as a storyteller, he tends to drag on and give us movies that often feel cliched. movies like Millon Dollar Baby (which won a best picture of the year accademy award). That’s what I mean about making movies for the mainstream. with Invictus, Eastwood certanly has a good idea. the movie is about nelson mandella, and the way he was released from prison to go straight into politics and run a country full of the people who kept him locked up for all those years. morgan freeman, eastwood’s longtime friend (unforgiven, million dollar baby), is tremendous in the role. it mightbe precchy and moralistic, but all of eastwood’s films are. that’s just his style. gran torino was the same way, but at least that movie strived to be different and got all dark and gritty. with Invictus, the longer it goes on, the more mainstream it gets. The first quarter of the movie or so is about mandela coming to terms with his new position in government and dealing with all the people around him. these people question him and his motives. they fear him because of what they or people they worked with did to him. they know he should be angry because of what happened to him, and they think he will take his anger out on them. at the very least, they think he will want nothing to do with them. and all of these assumptions are wrong. one of the first great scenes of the movie is mandela walking through the offices of the building where he will now be taking over as president of south africa, and seeing all the people packing their things away. he immediately calls them all in for a meeting, packs a conference room, gets up on the podium and explains to them that he needs them. if they feel that they cannot do their job because of how they feel about him, then that’s one thing, but if they think in anyway that they are going to be whisked out by him and his people, then they are completely wrong. he wants their help and he needs their help and he makes that abundantly clear. the next great moment comes not so long after that, when a bunch of white security guards with english accents show up in the room of mandela’s security team, wanting to start work. the head of freeman’s team, jason, (played by tony kgoroge, who looks a lot like chiwetel ejiofor), goes running off to find mandela and demand an explanation. and mandela convinces jason to at least accept that these people have his best intentions in mind and that they need to be fair to them and give them a chance. after this, there is still another wonderful scene of mandela dealing with adversity and using his persona and speech giving abiltity to calm the waters. the issue is the sprinbok soccer team (called football, of couse). this is the national team of south africa and it means a lot to the people who live there. the people have been under english rule, during the aparteid, for as long as they can remember. and they have always associated the springbok team with england and the english people who ruled their country. now that the south africans have finally been given the leadership of their own country, they want to create their own team. they want to change the colors of the team, maybe change the name, and make it something that is in every way different from what it was. to them, the team represents aparteid, simply because of the time it was in, and they want to demolish it. that’s when mandela shows up to a congregation of people who have gathererd inside a church to voice their opinions about this. and knowing how unpopular what he has to say will be, he goes ahead with it anyway, speaking about how they need to keep the springbok exactly the way it is. he tells them that right now the white and english people of south africa fear them and are afraid that they are going to change everything. he says that if they change the springbok, something that these people love, then they are doing exactly what these people are afraid of. when they kept him in prison, it was because they were afraid of him, and if mandela and the people of south africa now make these kinds of changes, then they are proving the people who are afraid of them right. mandela tells them that they have to be the better people. the stronger and nicer and more welcoming and understanding people. they have to lead by example, not be anger and a thirst for vengeance. this is the great argument of the movie and it only comes about a quarter of the way in. 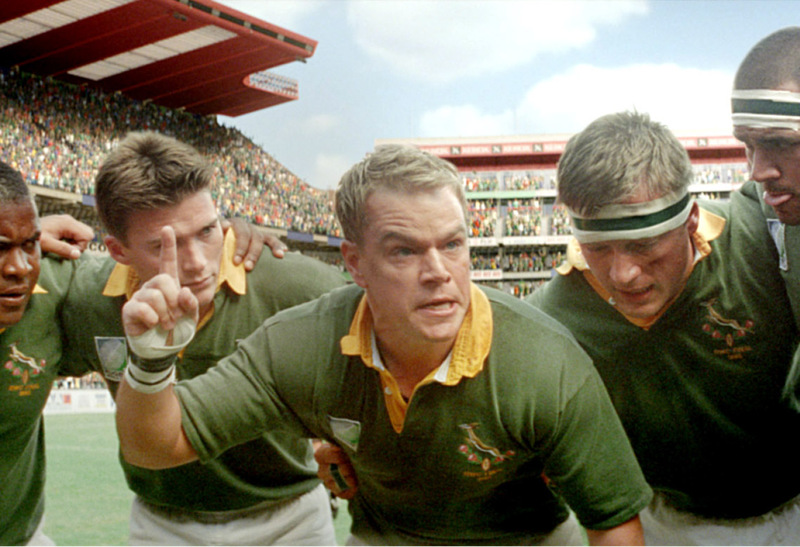 it is also the transition scene that launches us from the world of politics into the world of the springbok. suddenly the soccer team takes center stage and remains there for the rest of the movies duration. we meet the members of the team and see what they are dealing with. led by francois, (matt damon), this team is encouraged by their new president, nelson mandela, to win it all. the problem is that the story of the team is not all that interesting. 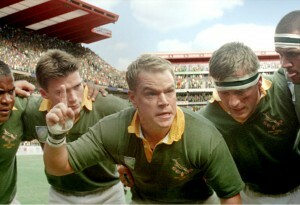 what makes this group of underdogs any different from all of the other underdog sports team movies? not a whole lot. 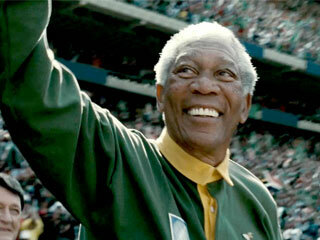 whenever mandela gets involved, like when he tells the team that they have to go out and play games with the people, and run camps to help them gain popularity, the movie gets elevated up a few levels. but whenever we get actual springbok games against other team, our interest begins to dwindle. and unfortunately that happens quite a bit. by the end, we have spent more time watching lenghty springbok games than doing anything else. that’s the way it feels anyway. it was the scenes of mandela dealing with people and trying to make them see his point of view, that made the movie so interesting in it’s first half. once he stops doing that and the movie leaves him to focus on the team, it becomes a completely different film. suddenly it’s a sports movie. that’s not what we signed up for. Invictus certainly felt like it was going places, but in the end fell into it’s own traps and became boring only because of how much it was like everything else. it started off on the right foot, but then lost its way and never recovered after that.